If thirty-year-old Therese Johaug of Norway is trying to scotch the dismay of the past two years, she’s doing it with her trademark high-turnover skiing and her top-step podium ways. In April of 2018, Johaug’s 18-month ban, for having the prohibited anabolic steroid clostebol in her bloodstream, ended. Back during her last full season on the World Cup, 2015/2016, it was not uncommon for Johaug to gap the field by large margins in distance races. This nascent season, the gaps are more pedestrian. She won the first World Cup distance race in Kuusamo, Finland, a 10 k classic interval start, by 22.5 seconds. 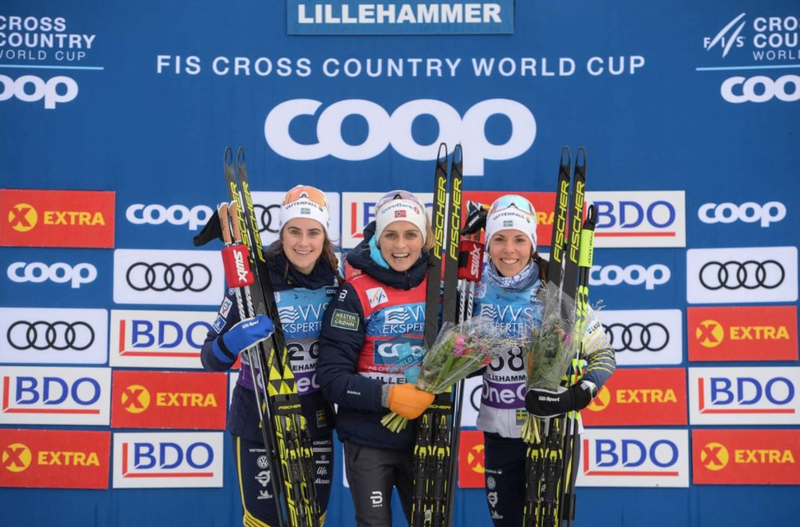 Today, in Lillehammer, Norway during the second of three days of racing, she won the women’s 10-kilometer freestyle individual start race. Johaug crossed the line in 26:22.4 minutes beating Sweden’s Ebba Andersson by 9.2 seconds. For the twenty-one-year-old Andersson, it was her second career individual podium: she placed third in Kuusamo’s 10 k classic. 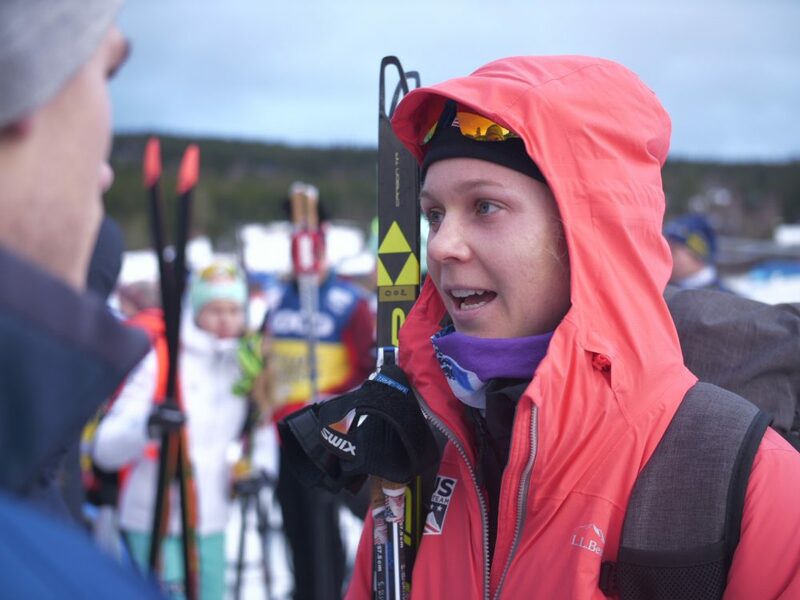 Andersson’s teammate Charlotte Kalla was third (+15.7) on Saturday. Johaug’s win on the second day of racing in Lillehammer was not trademark-decisive, she paced herself to earn the fastest split at every checkpoint. She bested Andersson by only 1.9 seconds at the 5 k mark, the gap bumped to 8.4 seconds at 8.3 k. By then, despite not having a huge gap of time, it was race over. Johaug never relented. Despite her two distance wins, Johaug, not known as a sprinter, sits second overall on the World Cup, 18 points behind Russia’s Yulia Belorukova. Johaug is positioned 2.5 seconds behind first-place Kalla in the Lillehammer three-day tour. The U.S. women put four athletes into the top-30. Sadie Bjornsen of the U.S. Ski Team (USST) lead the way finishing in ninth (+1:17.0) after placing third in yesterday’s skate sprint. Bjornsen lives and trains with Alaska Pacific University in Anchorage, Alaska. In her post-race interview with FasterSkier’s reporter in Lillehammer, she noted she had been troubled by the news of Anchorage’s 7.0 magnitude earthquake on Friday. The distractions for Bjornsen didn’t last long as she immersed herself in race-mode on Saturday. 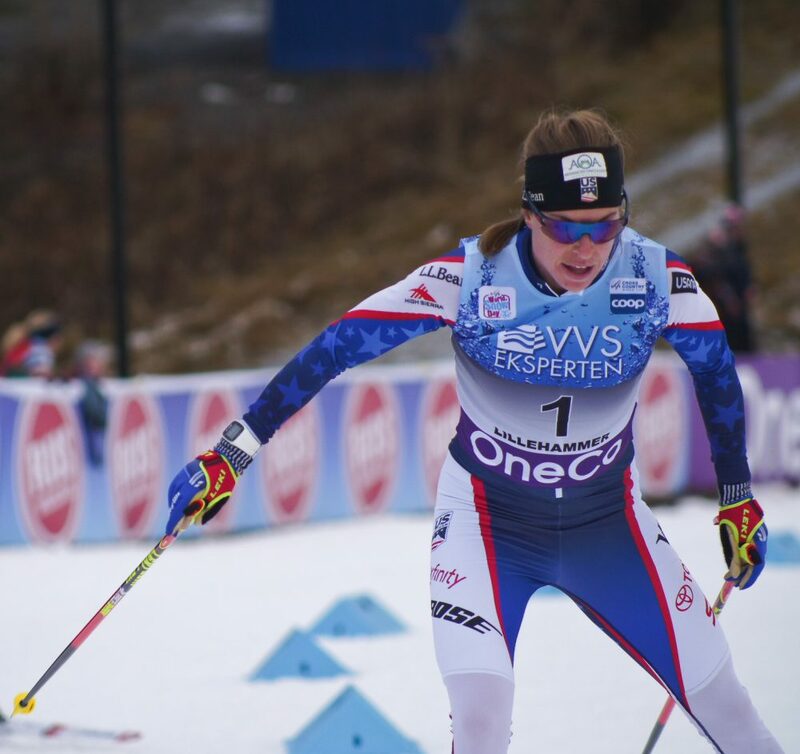 Rosie Brennan (APU) skied to 11th (+1:29.3) for her best career individual World Cup finish. Brennan, at twenty-nine, was not renominated to the U.S. Ski Team last season. Her return to the World Cup comes after a recovery from mono, and the disappointment of a lost season in 2018. Brennan began the day as the first starter. Although bib 1 was a new experience, it proved a good fit. In yesterday’s sprint, Brennan qualified in ninth and placed 21st overall— no small feat for a World Cup race in Norway where the home country is given extra starts for an eager crop of speedsters to prove their chops. It was Brenna’s second-best career sprint result. 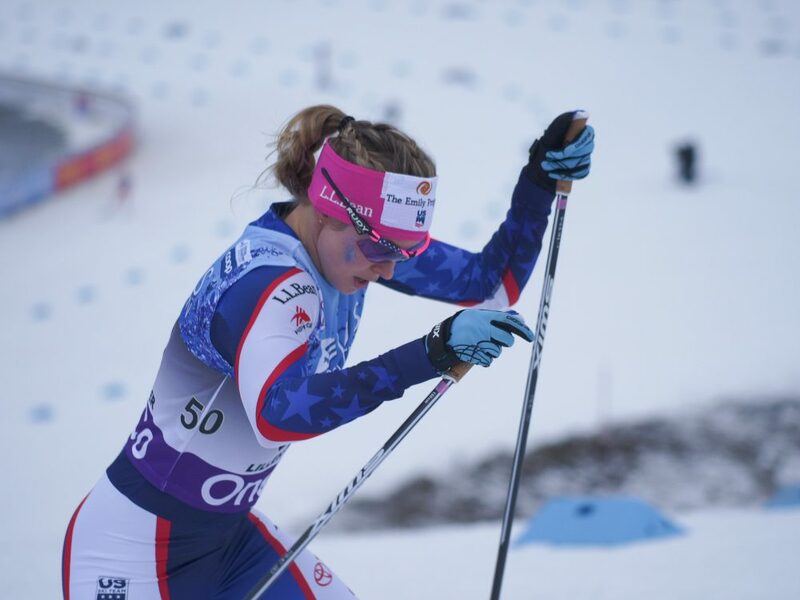 Jessie Diggins, second overall in last season’s World Cup, placed 12th (+(+1:29.9). Diggins is rebounding from a slight illness as she works through the second weekend of World Cup racing. Diggins will begin tomorrow’s 10 k classic pursuit 1:24.9 minutes behind the first starter Kalla. Caitlin Patterson, who skis for the Craftsbury Green Racing Project in Northern, Vermont, raced into the points for the 10th time on the World Cup. She finished in 30th, 2:28.2 minutes behind Johaug. Time wise, Patterson was in and out of the top-30 during the race. Her cohorts, in terms of race splits, were close. Finishing outside the points for the U.S. were Kaitlynn Miller (CGRP) in 60th (+4:10.4), Ida Sargent of the USST 63rd (+4:18.4), and Kelsey Phinney (SMS T2) 65th (+4:22.5). Racing concludes in Lillehammer, Norway tomorrow with a 10 k classic pursuit.